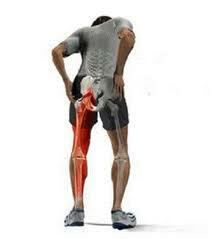 Sciatica is pain in the lower extremity resulting from irritation of the sciatic nerve. The pain of sciatica is typically felt from the low back (lumbar area) to behind the thigh and radiating down below the knee. The sciatic nerve is the largest nerve in the body and begins from nerve roots in the lumbar spinal cord in the low back and extends through the buttock area to send nerve endings down the lower limb. The pain of sciatica is sometimes referred to as sciatic nerve pain. Sciatica is caused by irritation of the nerve of the lower lumbar and lumbosacral spine. What are risk factors for sciatica? Risk factors for sciatica include degenerative arthritis of the lumbar spine, lumbar disc disease, and trauma or injury to the lumbar spine.